SAYING THE PLEDGE OF ALLEGIANCE http://rexcurry.net/pledge-allegiance-pledge-allegiance.jpg Pledge Allegiance? 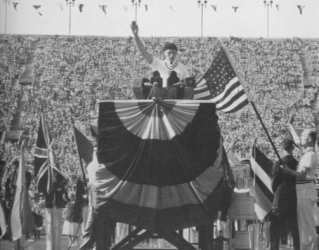 Francis Bellamy, Edward Bellamy, Looking Backward, Third Reich, Hitler salute, Nazi salute, Fascist salute, Swastikas, Holocausts are exposed here. Ae pl3j qlejns tu 6q fl4g qv 6q Yunaetid St3ets qv Qm3rikq, 4nd tu 6q repqblik for wi5 it st4ndz, wqn n3ecn, qndr Gad, wi7 librte 4nd jqstis for ol. Many politicians and their commentators use the Stars and Stripes as a merchandising tool for their own self-aggrandizingly patriotic screeds cashing in on their TV /media celebrity. In this, many of them follow the lead of their media employers, which have exploited the flag as a logo to sell themselves as more patriotic than thou. NBC made a post-9/11 decision to slap the flag on screen in the shape of its trademarked peacock. Is that flag desecration? Such flag-waving has gotten so out of hand that last month the turds in the House of Representatives passed a constitutional amendment banning flag desecration for the umpteenth time. The Pledge's early stiff-arm salute was the origin of the salute adopted later by the National Socialist German Workers Party (NSGWP), and the Bellamy dogma influenced the rituals, symbols and dogma of the NSGWP, as shown in the work of the documentarian Dr. Rex Curry (author of "Pledge of Allegiance Secrets"). When America’s patriotism turns this "garrulous," as Alexis de Tocqueville once observed, it "wearies even those who are disposed to respect it." DR. CAPITALISM'S WARNING: Before viewing this web site, keep your tranqs and heart medicine handy. It is no wonder why government schools keep children ignorant about the pledge. It is difficult not to recall the words of Herbert Spencer: "The ultimate result of shielding man from the effects of folly is to people the world with fools." Two years ago I met a Chinese student who was entering graduate school in the United States. I told her I had been in Beijing during "6-4," the Chinese shorthand for the massacre of June 4, 1989. At first I thought she might not have understood my Chinese, but it soon became clear that "June 4" meant nothing to her. I probably shouldn't have been surprised. In the 20 years since that day in 1989 when Chinese troops opened fire on unarmed civilians near Tiananmen Square, Chinese censors have managed to erase all mention of that tragedy from the country's textbooks and state-run media. 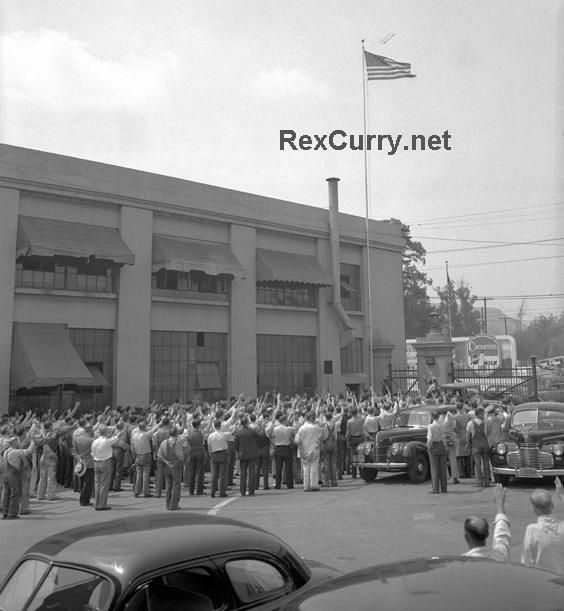 The American "Hitler salute" is shown in the following photograph of employees at the Los Angeles Department of Water and Power at Ducommon Yards. The stiff-armed salute to the flag is not something they do a lot of in the USA anymore. Back in the day, the straight-arm gesture was huge in America, but not so much now. 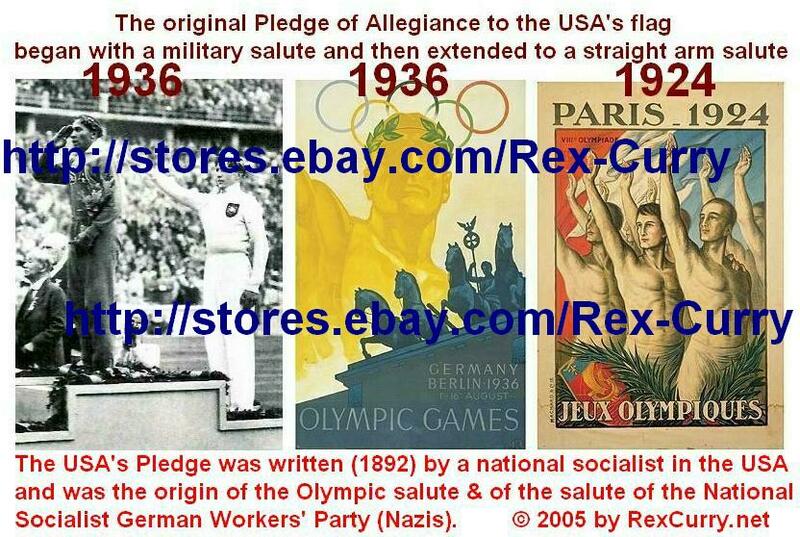 The Pledge of Allegiance (1892) was the origin of the stiff-armed salute adopted later by the National Socialist German Workers Party (NSGWP), as shown in the discoveries of the symbologist Dr. Rex Curry (author of "Pledge of Allegiance Secrets"). 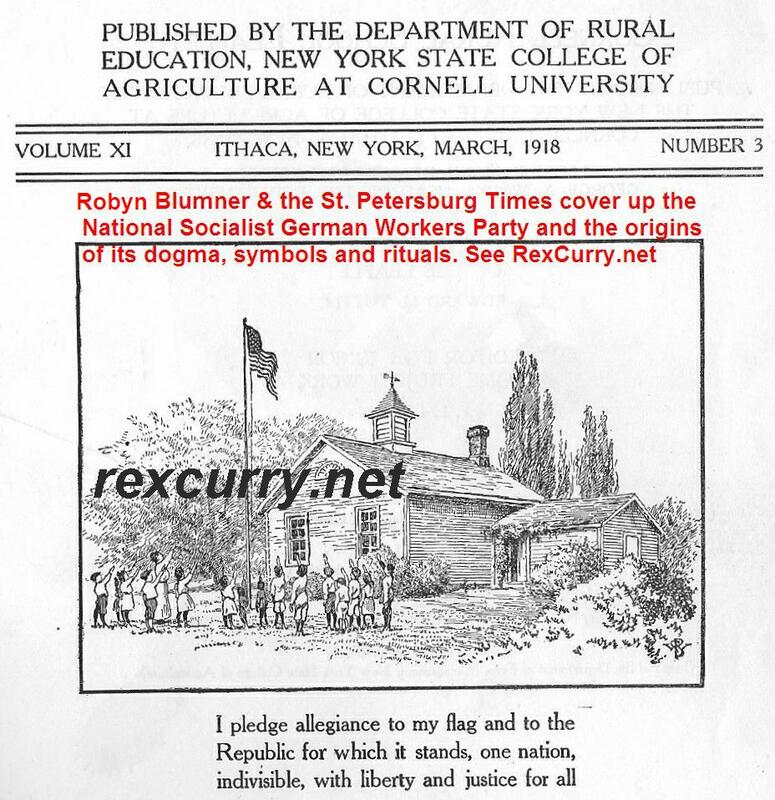 Francis Bellamy, author of the pledge, and his cousin Edward Bellamy, were socialists in the nationalism movement in the United States and they influenced the NSGWP, its dogma, symbols and rituals. The pledge was written to debut for the Columbian Exposition 1893 Chicago World's Fair. Today, adults do not want loudspeakers interrupting them every morning to command their mechanical chanting ala the dystopian book "1984"! Nevertheless, adults allow their children to be so abused in government schools where parents surrender their children. 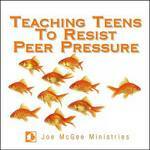 Adults also submit on occasion to the mechanical chanting due to bullying and peer pressure. Here is a description of the Olympic Oath in Los Angeles in 1932. Consider how familiar the act was to Americans who had been performing the stiff-armed salute in the USA's PoA for four decades, since 1892. "The voice of the announcer sounds again. It is introducing Lieutenant George C. Calnan, of the United States Olympic Team, who will take the Olympic Oath. A tall figure, erect and military, ascends the rostrum on the field as a hushspreads over the audience. He grasps the American flag with his left hand andraises his right to the sky. All over the field the athletes raise their right hands.Then, in a loud clear voice, come Lieutenant Calnanís words : 'We swear that we will take part in the Olympic Games in loyal competition, respecting the regulations which govern them and desirous of participating in them in the true spirit of sportsmanship for the honor of our country and for the glory of sport.' "
In 1892 (the year the PoA was created in the USA for the Columbian Exposition 1893 Chicago World's Fair), Baron de Coubertin gave his long speech at a conference celebrating the 5th Anniversary of the establishment of the Union of French Societies of Athletic Sports (USFSA), which favored his idea to revive the Olympics. The first revived games were the 1896 Summer Olympics in Athens, Greece. Written by Baron de Coubertin, the oath is taken by an athlete from the host nation while holding a corner of the Olympic flag. As far as is known, the oath as written by Coubertin did not involve any stiff-armed salute. 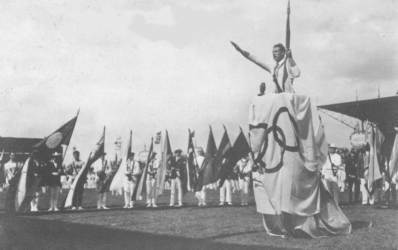 The athletes' oath was first taken by Belgian fencer Victor Boin at the 1920 Antwerp Games in Belgium. 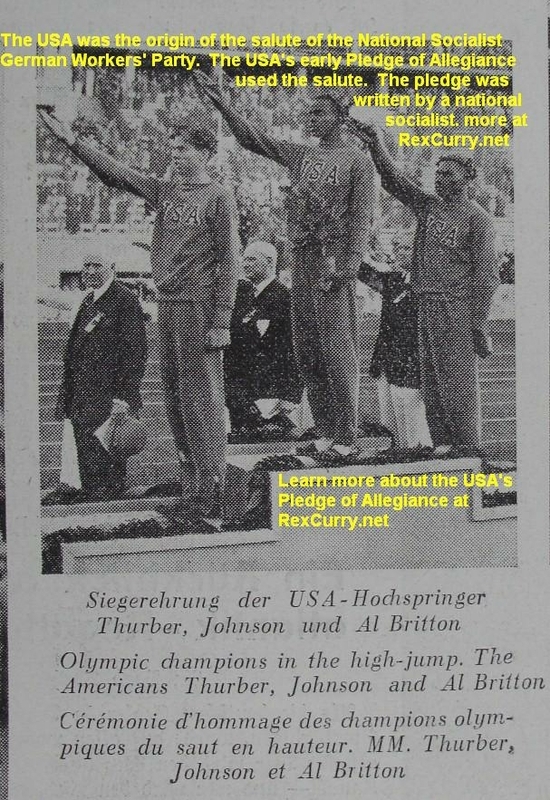 A photograph shows that America's stiff-armed salute was used by Boin in 1920 at the Antwerp Games (compare the coincidence in time to that of Italian "Consul" Gabriele D 'Annunzio, who borrowed the salute as a propaganda tool for his political ambitions upon his occupation of Fiume in Italy in 1919). Coubertin might have been involved in starting scouting organizations in France. 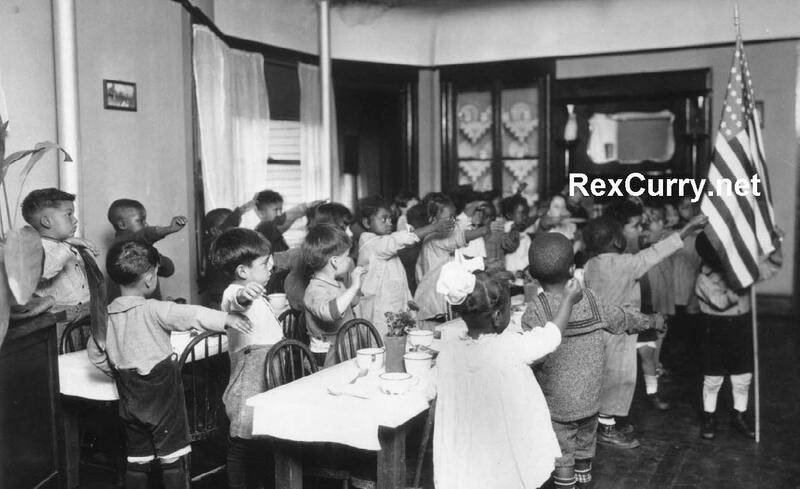 There is abundant proof of the brainwashing damage caused to children forced to robotically chant the socialist's pledge in government schools (socialist schools) daily for twelve years of their lives. a Bunch of Wealthy Celebrities Pledge to Redistribute Your Money and Force You to Bow to the Collective Good. I showed my caustic remarks on it [the video] to some of my students and they loved it. But then they were the same group who noticed an uncomfortable parallel to what happened during Tuesday's Obama Inauguration Day festivities and the film we have been viewing in their World History class -- Triumph of the Will -- Leni Riefenstahl's masterpiece of cinematic propaganda deifying Adolf Hitler at the 1934 National Socialist German Workers Party Rally in Nuremberg. Dana Tofig, a spokesman for the Montgomery County Public Schools, confirmed that the teacher violated school regulations and said the student will receive an apology. It is a children's chant so inappropriate that you never un-learn it. 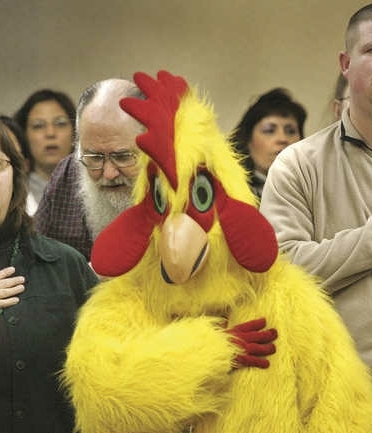 Because of the USA's police state rituals, people who chant the pledge of allegiance are made to feel like chickens, as shown in this photograph. According to an administrative complaint a health teacher at Oak Grove Middle reportedly became angry in September 2006 when a student failed to stand for the Pledge of Allegiance. The teacher told the student he was in a free country and should respect it, and that if the student didn't he should go back to Africa, the complaint alleges. The district suspended the teacher for 10 days without pay. In a proposed settlement, the teacher agrees to a one-year suspension, along with two years on probation and a requirement that he take a college-level course on cultural diversity. The settlement says the teacher neither admits nor denies the allegations. The Education Practices Commission, which sanctions Florida teachers for misconduct, will consider the settlement. As you know I am new here and would like help, as I previously stated, to restructure my class. Part of the problems I have is the administration. Here's something that happened last year during my homeroom that I am still reeling about. As normal, we had morning announcements via closed circuit TV and then came the Pledge of Allegiance which is pretty much the normal scenario for all of us. This particular morning one of my students got up and started doing a Nazi salute during the pledge yelling 'Heil Hitler'..... (the rest is available on the web). There is a reason for this ritualism, namely to reinforce loyalty to the group. From the Telegraph: "Researchers have found that if groups perform tasks in unison, such as marching, dancing and chanting, they show more loyalty towards each other and are less likely to go against the norm." The findings, published in New Scientist, could explain why the the Union of Soviet Socialist Republics, the Peoples' Republic of China, and the National Socialist German Workers Party all seemingly had the ability to bend millions of people to their will. Dr Scott Wiltermuth, of Stanford University in California and colleagues, have found that activities performed in unison exercise a form of mind control over people. The Pledge of Allegiance makes us feel as though we’re part of a larger entity, so we see the group’s / government's goals as being more important than our own. The Pledge is a mind eraser. Will you Pledge it in a school? Will you Pledge with other fools? I will not Pledge it in a school! I will not Pledge with other fools! Consider the movie "The 5,000 Fingers of Dr. T." For the plot, substitute a teacher in a government schools and substitute the Pledge of Allegiance to the flag in place of the piano. Plot: Young Bart Collins lives with his widowed mother Heloise. The major blight on Bart's existence is the hated piano lessons he is forced to endure under the tutelage of the autocratic Dr. Terwilliker. Bart feels that his mother has fallen under Terwilliker's sinister influence, and gripes to visiting plumber August Zabladowski, without much result. While grimly hammering away at his lessons, Bart dozes off and enters a fantastical musical dream, in much the same fashion as Judy Garland in The Wizard of Oz. In the dream, Bart is trapped at the surreal Terwilliker Institute, where the piano teacher is now a madman dictator who has locked up all non-piano-playing musicians in a dungeon and constructed a piano so large that it requires Bart and 499 other enslaved boys (the aforementioned 5,000 fingers) in order to play it. Bart's mother has been turned into Terwilliker's hypnotized assistant and bride-to-be, and Bart must dodge the Institute's guards as he scrambles to save both his mother and himself. He tries to recruit Mr. Zabladowski, who has been hired to install all of the Institute's sinks ahead of a vital inspection, but only after much skepticism and foot-dragging is the plumber finally convinced to help. The two of them empty their pockets and construct a noise-sucking contraption which ruins the mega-piano's opening concert. The enslaved boys cheerfully run riot, and the "VERY atomic" noise-sucker explodes in spectacular fashion, bringing Bart out of his dream. The movie ends on a hopeful note for Bart, when the real-life Mr. Zabladowski finally notices Heloise, and offers to drive her into town in his jeep. Bart escapes from the piano, and triumphantly runs off to play. The 5,000 Fingers of Dr. T. is a 1953 musical fantasy film. It is best known for being the only feature film ever written by Theodor Seuss Geisel ("Dr. Seuss"), who was responsible for the story, screenplay, and lyrics. It was directed by Roy Rowland. The film was rereleased in 1958 under the title Crazy Music. Are you with the illuminati or the ignorati?